Police in Charlottesville, Va., say they have arrested a 17-year-old male in connection with a threat that "contained vile, racially charged language targeted African-American and Hispanic students" at an area high school. At a news conference on Friday, police Chief RaShall Brackney said the suspect was believed to have made "threats to commit serious bodily harm to persons on school property" and to have carried out "harassment by computer." School Superintendent Dr. Rosa Atkins confirmed that the person charged was not a student at the school in question, Charlottesville High School. "Hate...violence...intolerance is not welcomed in Charlottesville," Brackney said. "And in Charlottesville and around the globe we stand firmly in stating there are not 'very fine people' standing on both sides of this issue," she added, in an apparent reference to remarks made by President Trump in the wake of violence sparked by a white supremacist rally in Charlottesville in August 2017. 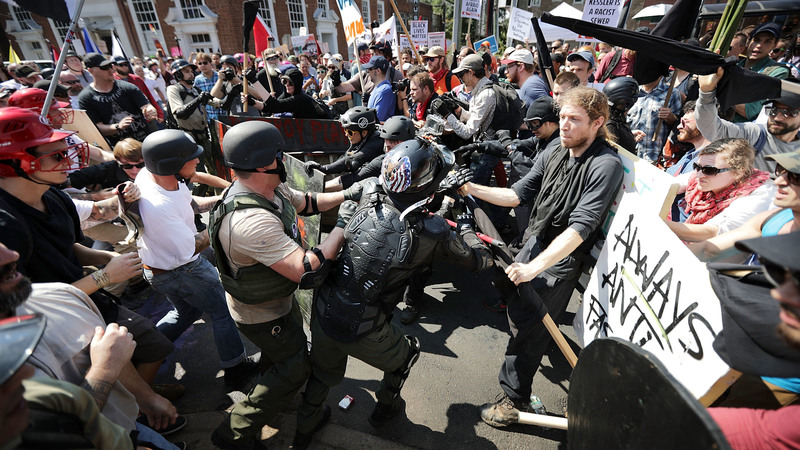 The incident is yet another blow to a community still healing from white supremacist gatherings in the summer of 2017, including the "Unite the Right Rally" that resulted in the death of one counter-protester and brought national attention to the city. Officials said they had decided to close the city's nine schools, serving more than 4,300 students, for a second day on Friday after a concerned citizen emailed school district administrators Wednesday evening with information regarding the threat. District officials released a statement Thursday evening notifying teachers and parents of the decision to close again. "We would like to acknowledge and condemn the fact that this threat was racially charged," the statement said. Speaking to NPR, Charlottesville resident Margaret Thornton — who taught at the high school from 2012 to 2016 — expressed concern about the how the latest threats might affect students. "What really initially occurred to me is how much trauma these children have been through since those rallies a year-and-a-half ago," she told NPR. She said the decision to close schools for two days indicates to her that the threat must have been serious. "The school district does not take the decision to close schools lightly," Thornton told NPR. She pointed out that many of the district's student are served reduced or free meals during the day, "that's two extra days that those kids don't have access to healthy, hot meals."